Over the bridge and under the tunnel, miles away from Fort Eustis, Virginia Beach has a great little Military Aviation Museum. Their collection is mostly from WWII, big and small. (And if you don’t think that a PBY Catalina is not a large plane, then you haven’t walked under the one they have there!) They also have a few planes of more recent vintage, and some that are older, including one of my favorite planes from between the wars, the little single-seat P-26 “Peashooter”, a plane that just looks like it would be a lot of fun to fly. There’s not an awful lot of heraldry in military aircraft decoration (the bikini-clad babe on the side of the B-25 Mitchell bomber notwithstanding), but I did run across one coat of arms on a plane there. 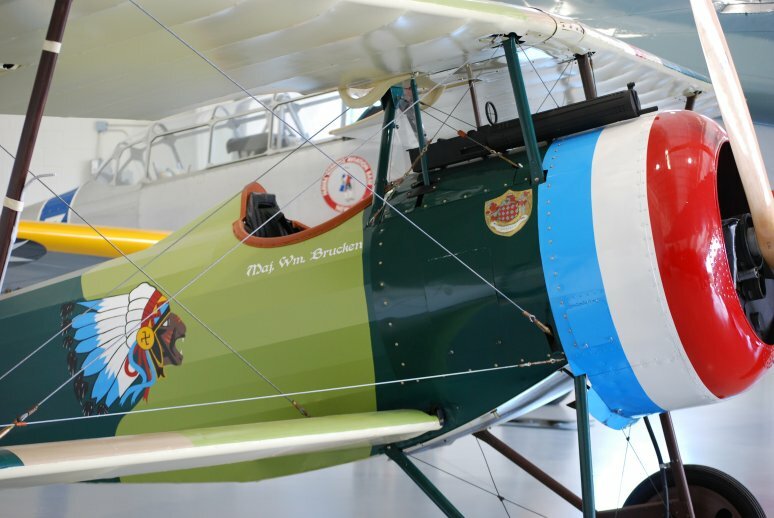 If I recall correctly, the plane itself is a French Nieuport; in any case (that is to say, if my memory is no better than it usually is), this restored one is decked out in the paint scheme of Major William Brucken. On each side of the nose of the aircraft, just behind the engine cowling, is a coat of arms, Lozengy gules and argent. 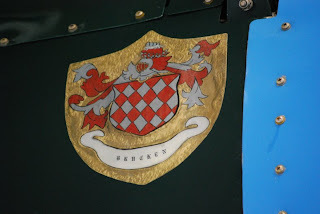 I have to admit, even fairly close up, it reminds me of something you might get at one of those “your family coat of arms” places, but hey, it’s heraldry, and as I have often noted before, you can find heraldry everywhere. In this case, even way out in the countryside at the Virginia Beach Airport, tucked away in a corner of a Military Aircraft Museum.